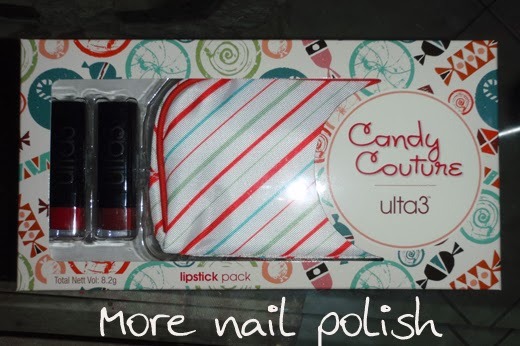 This holiday season, Ulta3 has released a nice range of nail polish and lipstick gift packs as part of the Candy Couture line. I've already shown you the Candy Couture Big book of nails, and today I have three more gift packs to show you. First up is this really cute clear tree bauble that has a bottle of polish and a lipstick. Look at me trying to be all fancy and arty holding the bauble. Let me tell you I tried a hundred different hand poses, and these ones were the best! I haven't actually opened my bauble, in fact I might gift it to someone. The swatch of Fairy Floss is from the bottle I got in the big book of nails. Fairy Floss is a sweet (pun intended) lolly pink. It has a jellish feel to it rather than being a straight creme polish. While it is still really squishy and glossy it's still opaque in two coats. I imagine this would be a popular shade, so I can understand why they have put this one in the bauble. This next set is just a lipstick pack. It comes with two lipsticks and a striped makeup bag. I will probably gift this pack as well. Finally is the nail art kit. The kit contains three regular sized polishes and they actually put three of the best shades in the box, being toffee apple, sour grape and fairy floss. There are also three smaller striper bottes of polish in black, red and white. The kit also has the same dotting tool that was in the mini kit earlier this year, together with the metal mixing plate and two sponges. Finally there is a sheet of black nail stickers in various designs. I think this set would make an excellent present. These packs are all on shelves now, and I've already seen a bunch of these at my local chemist.